For slewing crane hire where you need heavy lifting capacity alongside the ability to rotate through a full 360 degrees, our Demag is the perfect solution. If you need something extra, we’ve got Franna cranes as well, just like all the best crane hire companies in Perth. Also often abbreviated to Demag, our Terex 55T All-Terrain Slewing Crane is a Beast! The sectional boom and outstanding maneuverability along with the ability to go practically anywhere makes our Terex Challenger Demag ideal for work on even the tightest sites. The 55T Demag is also good for reach being able to lift over houses with 1000 kg capacity at 38m radius. Larger cranes are not always used for lifting heavy items! It’s the distance away from the crane where the job is to be landed, where larger cranes come into play. For fully mobile crane rental with a machine capable of traveling over even the roughest terrain, the Demag delivers fully. Demags excel for all your heavy lifting where the ground might be uneven and the access tight. Whatever you require, whether it’s bundles of timber hoisted up, packs of bricks distributing from plot to plot, or any pre-cast lifting, our skilled crane operators will get the very most out of this 55T slewing crane. Any construction materials too heavy for manual lifting will be up and where they need to be in no time with our Demag. For heavy commercial lifting, Myaree’s mighty slewing cranes come to the fore. Whatever your industry and however large the project, the Terex Challenger will get the job done quickly, easily, and with absolute precision. Some jobs are too demanding for a single crane, but that’s no problem for Myaree. We can dispatch multiple units, and dual lifting will nail the job that one crane would struggle with. 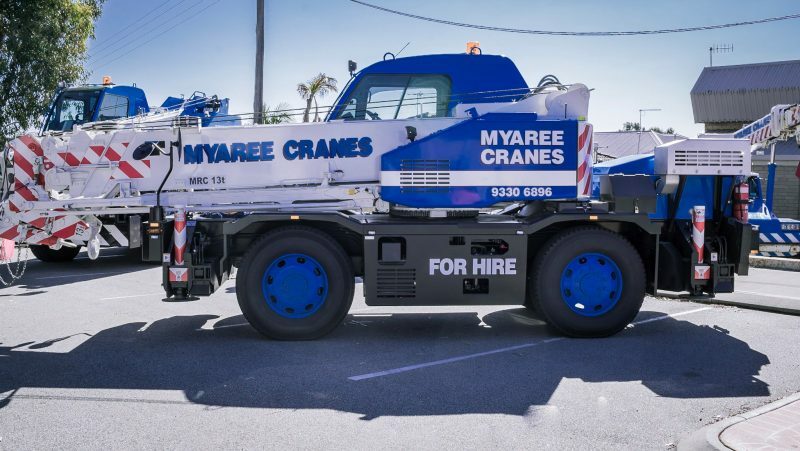 At Myaree, our highly skilled family-run team has more than 30 years of experience across all areas of crane lifting, and it’s fair to say that no job’s too big or small. If you’re looking for all the benefits of working with a small and close-knit company without losing out on the advantages a substantial firm brings to the table, get in touch today. While our results and testimonials speak for themselves, it bears pointing out that all our operatives have High Risk Work Licenses, and every job we carry out complies fully with OHSE regulations 1996. Along with experience and credentials, you’ll also get service with a smile, a small but important touch. While we aim to establish ongoing working relationships with all our clients, we also appreciate many people just need one-off assistance. We’ve got your back if that’s what you want, too. Our driving ethos is to get the job done well first time round. It’s no use getting things done quickly if you need to call the crane company back again to rectify mistake made by rushing. You won’t get that with Myaree Crane Services. For Tom Thumbs, slewing cranes, Franna Cranes and Demags, Myaree put you the customer first, a rarity in today’s business landscape. After three decades in the business, we must be doing a few things right, so contact us for crane hire in Perth and we’ll arrange for a lifting assessment showing you the best solution for your needs.